TORONTO (AP) Ricky Rubio’s big 3-pointer gave the Utah Jazz back-to-back wins for the first time in more than a month. 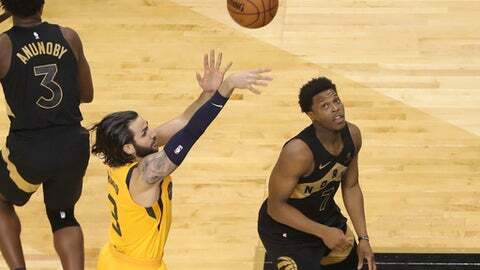 Rubio drained the winning basket with 4 seconds remaining as the Jazz earned a 97-93 victory over the Toronto Raptors on Friday night. Rubio had missed all four of his shot attempts in the second half, but didn’t flinch before firing up the game-winner. Donovan Mitchell scored 26 points, Rudy Gobert had 18 points and 15 rebounds and Rubio finished with 14 points for the Jazz, who won consecutive games for the first time since a six-game winning streak was snapped on Dec. 4. Utah also won at Detroit on Wednesday night, beating the Pistons in overtime. With Utah trailing 93-92, Rubio made his 3-pointer for the 14th – and final – lead change of the game. After DeMar DeRozan missed a jumper, Royce O’Neale sealed it with a pair of free throws. Joe Ingles scored 11 points and Derrick Favors had 10 for Utah. Jonas Valanciunas had a season-high 28 points and 14 rebounds, and DeRozan added 19 points for the Raptors, who lost for the fourth time in 22 home games. Toronto had won its previous four meetings with the Jazz. Serge Ibaka had 10 points and 10 rebounds, and C.J. Miles scored 10 points for Toronto. Valanciunas connected on 12 of 16 shot attempts, but the rest of the Raptors combined to shoot 25 for 79. The Raptors trailed by six to begin the fourth, but started the quarter with a 7-0 run. A 3-pointer by Miles sparked a 10-2 Raptors run that gave Toronto a 91-85 lead with 2:24 left, but a dunk by Favors and a 3 by Ingles cut it to 91-90 with 1:20 remaining. ”They did a good job of scratching and clawing, making everything tough on us,” Raptors coach Dwane Casey said. Valanciunas made two free throws to put Toronto up 93-90, but Mitchell replied with a pair at the line. DeRozan missed a pull-up jumper and Ingles grabbed the rebound before Rubio’s decisive 3. Jazz: Rubio led Utah with six assists. … Utah posted its seven double-digit comeback of the season. . G Rodney Hood (left leg) missed his fourth straight game. Raptors: Kyle Lowry shot 2 for 14, including 0 for 6 from 3-point range. … Valanciunas made multiple 3-pointers for the first time in his career. The Raptors wore their new back and gold jerseys for the first time. The design and color scheme was inspired by rapper Drake, the team’s global ambassador. Jazz: Host Golden State on Tuesday. Utah has lost its past three home meetings with the Warriors. Raptors: Host the Los Angeles Lakers on Sunday. Toronto has won six straight against the Lakers.